With tender chunks of beef enveloped in a deep, spicy and smoky sauce, Chili con Carne is like a chili-flavored beef stew. 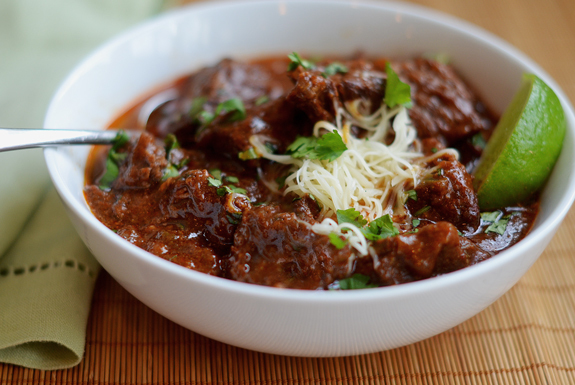 With tender chunks of beef enveloped in a deep, spicy and smoky sauce, Texas beef chili (or Chili con Carne) is essentially a chili-flavored beef stew. I can’t claim this version is authentic — I’ve never even been to Texas — but it is immensely satisfying, and everything I imagine the ultimate Texas beef chili to be. The recipe requires over an hour of prep and active cook time, plus several hours to simmer on the stove so it’s best to make it on a lazy weekend. You might also consider doubling the recipe; you can freeze some for another night (you’ll be so glad you did) or use leftovers for tacos, burritos or topping rice or baked potatoes. 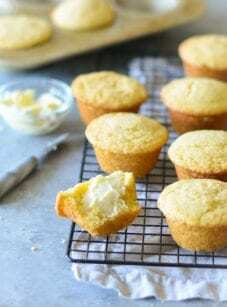 For a delicious side, try these easy Cornbread Muffins or Chile con Queso. Before we get to the recipe, it’s very important to select the right cut of meat, which is a chuck roast that is well-marbled. It should have a good amount of white veins of fat running through it. Stay away from meat generically packaged as “stew meat,” especially if it looks lean — it will never get tender. You’ll need to trim the excess fat; don’t go overboard, just remove any large flaps like the one the knife is pointing to below. Next, let’s talk about chile peppers. Purists insist that Texas chili be made with whole dried chiles (the kind you see in plastic bags in the produce department), toasted and ground into a homemade chili powder. This is labor intensive, plus every grocery store carries different kinds of peppers — there are enough varieties to make your head spin. So, rather than traipsing all over town searching for dried chiles, I use fresh jalapeños and a combination of two readily available pure chile powders: ancho and chipotle, which you can find at most large grocery stores. Note that these are dried, ground chile peppers — not to be confused with standard chili powder, which is a blend of ground chilies and other spices. Ancho chile powder is made from dried poblano peppers and has a moderately spicy flavor. Chipotle chile powder is made from dried and smoked jalapeños, which have a smoky and spicy flavor. Okay, on to the recipe! Begin by combining the spices and cornmeal in a small bowl. The cornmeal is used to thicken the stew. Add a bit of water to form a paste, then set aside. Next, fry the bacon until the fat has rendered and the bacon is crisp. Use a slotted spoon to transfer bacon to a paper towel-lined plate. Pour all but a few teaspoons of the bacon fat into a small bowl, then sear the meat in batches (the meat should be in a single layer) until well browned on at least one side, adding more of the reserved bacon fat as necessary. This process creates depth of flavor and adds wonderful dimension to the stew. Transfer the seared beef to a plate. Add some water to the pan — it will smoke — and scrape the bottom with a wooden spoon to release all the brown bits. This is called deglazing. Pour the flavorful liquid over the beef. Add a few tablespoons of the reserved bacon fat to the pan and cook the onions until soft and translucent. Add the garlic and jalapeños and cook a minute more. Next, add the reserved spice paste and cook, stirring frequently, until fragrant, a few minutes. Add the beef broth the pot. And use a whisk to stir until all of the spices are dissolved into the broth. Add the water, beer, crushed tomatoes, molasses, cocoa powder, seared beef and cooked bacon to the pot. Then cover and cook with the lid just slightly ajar for 2-1/2 – 3 hours, or until the meat is tender and the sauce is nicely thickened. Ladle the stew into bowls and top with chopped cilantro and grated cheese if desired. If you’re wondering about the spice level of this chili, it definitely has some heat but it’s not off the charts. I have even served it to kids, albeit ones with more adventurous palates. Mix the chili powders, cumin, oregano, coriander, cinnamon and cornmeal in a small bow and stir in 1/2 cup water to form a thick paste; set aside. Season the beef with the salt; set aside. In a large pot or Dutch oven, fry the bacon over medium heat, stirring frequently so it doesn't stick, until the fat renders and the bacon crisps, about 10 minutes. Using a slotted spoon, remove the bacon to a paper towel-lined plate. Pour all but a few teaspoons of fat from the pot into a small bowl; set aside. Increase the heat to medium-high. Sear the meat in three batches (it should be in a single layer), until well browned on one side, about 4 minutes per batch, adding more of the reserved bacon fat as necessary. (Hint: Once the meat is in the pan, don't stir or touch it -- leaving it alone will allow it to develop a nice brown crust on one side.) Place the seared meat on a plate. Add about 1/4 cup of water to the pot (it will smoke), and scrape the bottom with a wooden spoon to release all of the flavorful brown bits. Pour the dark liquid over the seared meat. Reduce the heat to medium and add 3 tablespoons of the reserved bacon fat to the pot. Add the onions and cook, stirring frequently, until softened, about 5 minutes. Add the garlic and jalapeños and cook 2 minutes more. Add the reserved chili paste and sauté until fragrant, a few minutes (it will look clumpy and stick to the bottom a bit -- that's okay). Add the beef broth and stir with a whisk until the spice mixture is completely dissolved. Scrape the bottom of the pot with the whisk to release any spices. Stir in the the water, beer, crushed tomatoes, molasses and cocoa powder. Add the reserved bacon and seared beef (along with the juices from the beef on the bottom of the plate) back to the pot and bring to a boil. Reduce the heat to low, and cover, leaving the lid just barely ajar. Simmer, stirring occasionally so the bottom doesn't burn, until the meat is meltingly tender and the juices are thickened, 2-1/2 - 3 hours. Taste and adjust seasoning if necessary. Note: When selecting the meat, be sure not to buy anything generically labeled "Stew Meat." Also, you will lose about 1/2 pound after trimming the fat, so if you buy the meat already trimmed and cubed, you'll only need about 3-1/2 pounds. Tip: To make bacon easier to chop, try placing it in the freezer for 15-20 minutes first. The colder it is, the easier it is to cut. Note: If you touch the seeds of the jalapeño pepper, just be sure to wash your hands well and avoid touching your eyes. Freezer-Friendly Instructions: The chili can be frozen for up to 3 months. Before serving, defrost it in the refrigerator for 12 hours and then reheat it on the stovetop over medium heat until hot. i liked the idea of this recipe, and really liked that you use some of my “secret” ingredients (molasses, for one) to make chili that much more better. but i have dozens of ways to make chili, that vary based on the types and numbers of proteins and veggies and beans used, not to mention the method of cooking now that i’ve had an instant pot for a few years. went full instant pot on this. sautee and slow cooker modes. subbed in red bell pepper for jalapeno (plenty of heat from the chipotles and chorizo). subbed in chorizo for the bacon for more spice and specific flavor. went with a pureed chipotle/garlic/seasoning rub (coriander, cumin, sazon, about 1hr) for the beef before browning. subbed in a Tb dona maria mole, mixed in with beef stock . used only 3 cups stock, 1/2 cup guinness. subbed in masa flour for corn meal (slight difference, but important). sequence: chorizo (remove and leave fat), beef (remove), bell pepper, onion, garlic, re-add chorizo, masa flour, re-add beef, tomatoes, stock. the masa is the thickener and needs a little cooking before adding too much liquid. slow cook 3 hours, or until beef is tender. so…yeah, i kinda completely reworked your recipe but the flavor, spice and thickness are superb. it’s smoky, sweet, spicy and thick. please don’t be upset because i almost never follow a recipe and usually combine 2 or more to get where i wanna be. yours was a great inspiration for a dish that i can make with my eyes closed, but needed a fresh look. This recipe is a proven winner! Took our company chili cookoff title with it this week. A few things I added were Allepo pepper and Brown Sugar. Also threw in a lime to tame it will simmering. I hope I can get this question answered in time! I’ve made this and it is too spicy for my kids. Wonderful taste, but too spicy! What would you suggest I do/add to tone this down? I know there is a solution to this. Thanks so much I’m advamce! Hi Colleen, You could try adding some dairy to the kids’ portions, like sour cream (or if you don’t have that, cream, milk or evaporated milk would work, too) — that will tone it down a lot. You could also try some lime, but I think dairy is your best bet. Hope that helps! Thank you…sour cream and cheese, plus extra tomatoes (2 cans) and some brown sugar helped a lot. Love the taste, so now I’ll know better how to tone it down next time! Your cookbook is right next to my old-time favorites in a prominent place in my kitchen! This is a really hearty, flavorful chili. I have never tried a Texas-style chili, and wanted a new version. It is rather labor intensive, and took longer to prepare than I anticipated from reading the recipe. Served it with grated cheddar, tortilla chips, lime wedges and cornbread. I think I prefer what I think of as a more traditional chili (ground beef/chicken chili with beans), but this was really tasty. I might use a little less chili powder if I make this one again. it was delicious! Thanks for the base recipe. I made this incredible chili two nights ago. I followed the recipe exactly and it is truly the very best I’ve ever tasted…. my husband and foodie friends completely agree. The flavors are deep and dark, underlying heat is just right – I could step up the ground chipotle and garnish with chopped jalapeños in the future. The beef was lean, and “melt in your mouth” tender/fall apart. Wow is this fantastic!!!!! I was excited to make this chili but very disappointed with the result. I followed the recipe exactly but ended up with a watery soup instead of chili. I think it has way too much water and needs much more flavor. Maybe increase the chili powder and cumin and definitely reduce the water! I agree – WAY too much liquid in this. Can this be made with ground beef and be used as enchilada sauce? Hi Amy, did you mean enchilada filling (not sauce)? If so, while I think it could work, I think you’d have better luck with a recipe that already includes ground beef like this chili. The absolute most AMAZING chili I’ve ever tasted. Sure, it takes awhile to prepare, but it’s SOOOO worth it! My favorite chili con carne recipe. I add about a tablespoon or so of brown sugar for more of a sweet heat. I also reduced the water by half a cup or more and add some cornmeal to thicken it. I only use one jalapeno since my daughter won’t eat it if it’s too hot. I guess the jalapenos we always have are very hot! Just one and you can taste it. The meat gets so tender! I cooked it on low for 3 hours yesterday and it was perfect! We served it with cornbread muffins and on top of Fritos with some cheese and sour cream. I would say this is medium-low on the spicy heat scale. I used the same spice brand as Jenn. The presentation of this recipe was very helpful because I’m not a very good cook. The folks at my Sportsman club really loved this, I had nothing left to take home. Love this recipe…it’s great and easy to make my own with additions. It’s my go to chili recipe. I entered my office chili cook off contest, never made chili before, used this recipe and won. The recipe takes some work and patience but worth it. This is the best chili we have ever eaten, period. It’s our chili recipe from now on. Thanks! So good I ate it for breakfast the next morning. Have made this chili several times…easy to make and the flavor is complex. We love it…it’s become our go to chili. MY FABORITE CHILI RECIPE! but I can’t do chili without beans, so I do add chili beans!! Ever since I first made this, my husband prefers this WAY over ground beef chili! Pre ordered your cookbook..CAN HARDLY WAIT! Do you know what the total volume of this recipe is? I need to bring 1.5-2 gallons of chili to a party and I’m not sure if I need to triple or quadruple the recipe. Hi Charlotte – it’s been a while since I made this, so I can’t reliably tell you the volume – I’m sorry! Do you know how many people it will need to serve? If you’re in doubt, you could always make more than you think you’ll need – it freezes nicely for future meals! I’m not sure of the guest count, I was just asked to bring that much by the host. Happy to hear it freezes well, I’ve never had leftovers because our family eats it all, we love it so! Thank you for replying. Hi, what would be a good substitute for the lager beer? White wine perhaps? Hi Ciara, you can just replace the beer with water. Hope you enjoy! Hi! I decided to make this wonderful chili for the Superbowl yesterday. I followed the recipe exactly and it was truly wonderful. The flavors all came together perfectly. I had rave reviews from my guests. I would not change a thing. I was worried about there being too much liquid but it really did thicken up nicely. I also made Jen’s cornbread recipe and it was a delicious complement to the chili. Thanks so much for this recipe! This was incredible! I made two batches, one vegetarian and one with the meat. I had to dial back on the spice for the one with meat as I can’t eat spicy food. The flavours of this were incredible. The beef just melted into the chili! I will definitely be making again. I don’t have an instant pot (although I know they have really grown in popularity)! I’m a bit more of a traditionalist, so I’m not sure if I will be purchasing one (unless I cave :)), but these tips look like they could be useful in converting traditional recipes to ones that would work in a pressure cooker. Hope that helps! OMGosh! I thought I made good chili until I made Jenn’s Texas Chili🌶 . Without a doubt, the BEST chili I’ve ever eaten…. and I’ve lived in Texas and Southern California. The complement of spices are out of this world. I would not change a thing. This recipe deserves 6 ⭐️’s. I rarely make a recipe for the first time when I have dinner guests but every recipe I’ve made from Jen has been fantastic. I followed the recipe exactly and it was a big hit. I also made her Cornbread recipe which is my new go to. First off, I am a Texan. Second, I just made your recipe. I subbed the jalapeños for four poblanos. I simmered for eight hours. At the end, I added two tablespoons of cornstarch mixed with two tablespoons of water. Simmered for 10 minutes and it thickened beautifully. You perfected a cross between Texan and Mexican flavors! This is the best chili recipe! I’ve made it twice and am making it again today- so perfect for a cold winter night! Absolutely the best Texas Chili recipe I’ve ever tried. Yes, there was some juice left over but I added some browned ground beef and a can of black beans (which makes it no longer “Texas Chili”) and got another meal out of it. The flavors are fantastic and no complaints about leftovers for another dinner. Would change a thing. Texas chili – I’m not from Texas either, and while this had interesting, complex flavors, it was WAY TOO MUCH liquid. Should be served with a straw. Recognizing this while making, I reduced liquids by 25 – 30%, and increased the masa harina to add some thickening. Still VERY soupy, not at all chili like. I love the flavors in this recipe! Delicious! Although… it turned out a little bit more soupy then i’d usually have my chilli. I added in a small amount of flour and substituted the beer for Coke. Has anyone used a pressure cooker for this recipe? Most have a sauté ability before finishing with the pressure so would still be a one pot dish. Absolutely outstanding! Best chili recipe I’ve found. Followed it to an absolute T, except that I used boneless short ribs (my fave cut to use for chili) instead of chuck roast. Thank you…I’ve found my keeper! I LOVE so many of your recipes but since I LOVE chili..I have to say you Texas beef chili ( chili con carne) is THE BEST!! I do add a quart of canned tomatoes and leave out the bacon. I do adore bacon🙃 But really prefer the chili without it, after making it both ways. Nothing better than chipotle powder! I have made this recipe five times now. Hands down one of the best chili recipes I have found online. Yes, I alter the recipe a bit depending on my mood and always add one or two chopped fresh ghost chilies. This recipe is a keeper. Thanks Jenn! Your Texas Beef Chilli has become a weekly staple in our home and is, without a doubt , our favourite chilli recipe ever. I may substitute a bottle of Guinness one day just to change it up since my wife is Irish.! This is a terrific recipe (and I live in Texas y’all). I made it for the Super Bowl celebration and it was a big hit, and so it made an appearance again for the Final Four festivities. The first time I followed the recipe exactly, second time I made it without the bacon, and I thought it equally good. A keeper. Delicious, nuanced flavors and perfect amount of heat. Even simmering for hours with the lid off, this was very “soupy” and I had to reduce the liquid at a low boil for 45 minutes or so to hit a stew/chili consistency. Will probably omit 2 cups water next time. Hi Jenn – Thank you for another very easy recipe to follow! Hi Terri, You could add a dollop of sour cream to each bowl when serving. The dairy will help neutralize the heat a bit. You could also try adding more of the crushed tomatoes. This piece has some interesting suggestions too. Hope that helps! Thank you, Jenn. The tomatoes, plus two pinches of sugar, did the trick. The chili was a big hit. I appreciate the help!! Looking forward to trying more recipes. My favorite chili recipe! I will sometimes substitute the bacon with spicy sausage. I also use El Pato tomatoe sauce (red can) and will deglaze after the beef sear with red wine and some water. A real crowd pleaser! Easy and delicious. This recipe makes a bomb chili!! I switched peppers, chopping one poblano instead of the jalapeños. That turned down the heat just enough for our palate. And I don’t keep corn meal around, so I used a 1/4 cup of corn bread muffin mix, and the paste was still perfect… And it only took a Jiffy! Next time I’m gonna add in some corn… About one ear of roasted sweet corn cut off the cob should be amazing! I may actually tempt to make your recipe for Texas Beef Chili, but I wonder if I can substitute turkey for the beef. If so, any hints to doing it? Hi Michael! Unfortunately, turkey won’t work here, but you could give my new chili recipe a try and replace the ground beef with ground turkey. Hope you enjoy it if you make it! My Chili is very soupy can you please tell me if there is a way to thicken it up without compromising the flavor. Hi Nanci, If you continue simmering the chili with the lid off, it will thicken up nicely. You can always add a little more cornmeal too, if necessary (but not too much). Just made this again!! It’s the best chili ever!! The layers of flavors are perfect! Thank you! Hi Bobby, I would also cook all the vegetables on the stovetop, and then transfer everything to a slow cooker for 4 – 5 hours on high. Hope that helps! I have a slow cooker that will sear the meat and then I can adjust to slow cooking. You may want to look for an all in one slow cooker. Love mine! Wonderful stuff! The flavor is incredible. (but I sure made multiple messes in the kitchen!) I decided to leave the jalapenos out and it was still plenty spicy. I suggest making a big batch and freezing for winter dinners. Enjoyed this dish New Year’s Day after making it in October! This recipe won the chili cookoff! This recipe looks amazing. My question is how to adjust it to not lose flavor, but lose some heat. We are not spicy food eaters, but like the chili flavor. Any suggestions ? Hi Kim, First, when using jalapenos, make sure to seed them as that’s where all the heat is. Also, you can cut back on both of the chili powders, especially the the chipotle chili powder, which is pretty spicy. Keep in mind that there is a lot of variation in different brands of spices. The ones I use (McCormick) aren’t that hot, so you may want to go with those. Hope that helps! I have been making chili for Halloween for 25 years and this is by far the best ever! I followed the recipe to the T and it turned out absolutely perfect. The paste is the key and again make sure you use a chuck roast and not stew meat. The chuck roast we used definitely made a big difference. Served it with a side of jalapeno cornbread – Barefoot Contessa’s recipe. YUM Can’t wait until next Halloween. I just bought “stew” meat before reading your review. Will it really be that bad? Any suggestions? Hi Marie, It really is much better with chuck. The stew meat just won’t be very tender. Sorry! Is the quarter cup of ancho correct? It sounds like a lot compared to a tablespoon of chipotle. Yes, Dave – I know it sounds like a lot but it’s correct. Big hit! So much better than chili made with ground beef. Followed recipe except I left out the cinnamon. My new favorite chili recipe, the flavors are wonderful, everyone in my family loves this chili! Takes some time to make but well worth it! We started looking for a chili without beans and ran across this one. Wow! Amazing. I pulled the reins on the onions and jalapeños using 1 onion and 2 small peppers with the hope that my children would eat it and it worked! Thank you Jenn for the recipe. I look forward to cooking more of them. We enjoyed this dish! Loved the tender meat, great flavor, & the sauce thickened beautifully. A great change of pace from my usual ground meat chili. I didn’t have any molasses, so I just substituted real maple syrup. I plan to try the molasses next time. Also, I had to watch the heat for my kids, so I used 2 jalepenos & reduced the gd. chipotle chili pepper to 1 tsp. I followed everything else as directed. Thanks so much for sharing, Jenn. It’s much more fun in the kitchen now! I wanted to make some home made chili. I Googled it and all these recipes come up calling for – dig this – canned beans and ground beef. Canned beans and hamburger meat, does that sound like good home made chili? Then I says to myself, maybe Jenn has something… Yep she comes through again! It came out great. I followed it pretty close, only adding about 3 cups of cooked organic red kidney beans. I wanted beans in my chili but not canned. Also I cut back on the jalapeño pepper using one rather than 3. But these peppers I have are very hot. Finally I use homemade beef stock rather than box grocery store stock. My sons love it. One of them commented saying, this is good chili, you ought to make some again. Jenn is da bomb! Yes, you can definitely make it ahead. Enjoy! Bravo! Thank you Jenn for posting this recipe! I made it today and my family devoured it with requests that I make it again this week. The flavor was perfect! Hi Jenn. My community is having a chili cook off at the beginning of the boating season. Do you mind my using your recipe if I give you credit for it? I’ll let you know if you’re a winner. ? Definitely– hope it wins :)! This is the best chili I have ever made! The flavors are so rich and bold…it is just luscious! My husband said it was the best chili he has ever eaten! I had to modify just a bit to suit the varying degrees of heat we can tolerate and cut the cinnamon in half but the rest I followed to the letter. This chili is to die for, which doesn’t surprise me. All of Jennifer’s recipes are wonderful. The molasses and chocolate give such a great depth of flavor. This is my new go-to when I want to impress someone with chili. Thanks again, Jennifer! Hi, made this a few times now and the whole family love it. One of the things I enjoy about cooking your recipes is the challenge of the different ingredient names, eg cilantro = spring onions. Also, when I cook the bacon I get nowhere near the quantity of fat coming out that you describe, I always end up adding more oil later rather than having an excess. Differences in the ingredients I suppose. Never used Ancho chilli powder before but love the levels of flavour and heat you get from adding different chilli powders now. Afraid I had to leave the chipotle out though, when opening the packet it had that distinct “ashtray” odour and I didn’t want to risk it tainting the whole dish. Subbed it for a similar amount of hot chilli powder instead. Love it! My husband and I absolutely love this chili. Hands down best. I am planning to make a large batch for a party (and of course we want leftovers). Could I simply double the recipe. Yes. She says it in the first paragraph. 1. I used Dried Mulato Chiles about 8, reconstituted and blended using beef broth. 2. I used canned Chipotles in adobo sauce. I put in 3, also blended. I was delighted to find your recipe, as I was tired of my family recipe for “real chili” and was intrigued by your choice of spices for the paste. It was very good but way too spicy. Jalapeños can vary in heat, so I wish I had gone with my instincts and just added one. The flavor profile was so good, but the heat spoiled it. It was also a bit more complicated than it needs to be. I will definitely use it again, though, with some adaptations. That’s the fun part of cooking – personalization! Love your recipes and website. Thanks for sharing your expertise. Made this yesterday, it is excellent! Didn’t change a thing, has a little kick, but it is soooo good. We liked the lime squeezed on with a little cheese. Reheats well the next day. Do you mind sharing what brand of stainless steel cookware do you use? Hi Lu, I love All-Clad or Anolon Tri-Ply Clad Stainless pieces. Check here for more info on some of my favorite tools for the kitchen. In San Antonio, Texas and can’t find this type of chili (everyone uses hamburger). I have been craving and looking for a recipe and this one nailed it! Made this last night and ate it today! Absolutely delicious!! Used dried Anchos and chopped in the food processor because our store didn’t have a powder. Thank you very much for sharing your gift and talent! Loved this recipe, bit of work to get it started but totally worth it. the smokey hearty sauce really works great. Will be making it again. Can’t wait for dinner tonight! It’s been simmering away for a couple hours now, but I would like to be a little thicker. Could I use a water/mesa slurry? Hi Nicole, Yes, but it will continue to thicken as it cooks so I would definitely wait til it’s done. Thanks! I added just a little at the end and it came out absolutely perfect. (Right up there with your Peruvian Chicken…our favorite dinner!) Even the kids gobbled it right up! Do you think this could be done with pork instead of beef? Hi Bonnie, Yes, I think that would work well. Not the greatest chili I have made or eaten. It was lack complexity of flavors and wasn’t at all chili like. The color wasn’t red, but more brown. There was no heat. It was more like a beef stew. I am going to doctor up the leftovers with roasted carrots and potatoes and see if that helps. If making this in advance, can it be refrigerated in the Le Crueset pot it was made it or should it be transferred to an airtight container? Hi Susie, It will be fine in the Le Creuset pot. Enjoy! I’m making this now, it’s simmering and me and my wife can’t really wait to taste. But, we have to. The house smells awesome. I adjusted the recipe a bit for we had no chipotle chile, but, I guess everything will be fine in the end. This is so much different then we use(d) to make our chile. Thank you so mucho for sharing this great recipe. Hi Bernice, Chuck roast works best. This is how my grandfather always made it (hunks of beef, no beans!) but he sprinkled a little cornmeal in to thicken it. Hi there. This looks amazing and I’m going to try it this Saturday for a church chili cookoff. I’m wondering about using the ancho chilis in the adobo sauce instead of the ancho chili powder. Would I also use about 1/4 cup? This makes a big quantity, but was completely eaten up by my boys and their 4 friends. I tried finishing this off in the slow cooker, but it didn’t work too well. This is a dish that needs to simmer on the stove so that all of the flavors blend. It’s important to taste it at the end to adjust the seasonings. I added more spice. This is so delicious and a much different change from regular plain old beef Chili! This is an excellent recipe. I spiced it up a bit by adding a couple of dried chiles to the pot being careful not to let them break and removed them before serving. The cilantro is a very nice addition, I served some sour cream on the side as well. This is a keeper. Had no bacon, so replaced it with chorizo. One of my best recipes ever. Made it last sunday and making it now (5 days later) again. Hi Jenn. Loved the flavour in this recipe but found it a bit too spicy for our taste. Any advice for what to cut back on – ancho chili pepper, chiptotle powder or jalapenos – to maintain the flavour but reduce the heat? Thanks! Hi Janet, A few thoughts…Did you seed the jalapenos? That’s where all of the heat is. Otherwise, you can cut back on both of the chili powders, especially the the chipotle chili powder, which is pretty spicy. Also, there is so much variation in different brands of spices. The ones I use aren’t that hot, so you might try those. Hope that helps! This recipe looks fantastic and perfect for my office Chili Cook Off tomorrow. Going to put it together late tonight and let it cook in my slowcooker overnight to be ready in the morning. I made this as my first recipe in a new clay pot and it is wonderful! I did use Masa Harina instead of cornmeal – I live in rural NW Montana and have been able to buy it for years. I think the Mexican Masa has a more corn-y taste as well as a smoother texture and I use it as a binder instead or with flour or cornstarch. Also, I had dried ancho chiles so softened and blitzed with water instead of the ancho powder. Another reviewer nixed the cinnamon, but I prefer a wee bit of cinnamon in a tomato sauce-ish dish. To me, the right amount enhances and cuts some of the tomato acidity. I wish I’d doubled the recipe but fortunately chuck is on sale this week at my grocery! Hey jennifer, came across ur website by accident. Saying you’re recipes look mind blowing is an understatement. Is there a substitute that I can use instead of bacon fat? Made this for the Super Bowl last weekend and it was a HIT! Great flavor! I made this chili for a party, and it was well liked. I felt like the meat wasn’t tender. Do you have suggestions for what may have caused the meet to become tough rather than tender? Hi Heather, Happy to help troubleshoot. Did you use chuck? Oftentimes, meat sold as “stew meat” is not the right type of meat and it does not get tender, no matter how long you cook it. Made this yesterday. The flavors were exceptional. It takes some time, but was fun to make with my husband. Having never tried real Texas chili, I couldn’t wait to give this recipe a try. All I can say is WOW – so good and sooo much better than the ground beef chili I usually make. It took me quite some time to prepare but it was worth every minute! Hi Jenn, this looks so delicious! Can it be made without the beer, and what would you suggest substituting in its place? Hi Katie, It can absolutely be made without the beer; just replace with water. Hi Brenda, I suppose it could, but you’d still have to go through all the initial steps of cooking the bacon, searing the meat, sautéing the veggies, etc, so I’m not sure it’d really make sense unless you need to leave the house to let it cook. The recipe looks good but is not a Texas chili. Remove the bacon and use chipotle peppers instead of the powder. The flavor difference is incredible. Great basic recipe to use to add your own zest to tho. Cinnamon needs to be axed. We like spicy. Here in Texas we would use canned ancho chilies in adobo, and masa (corn) flour rather than straight cornmeal. Masa is what’s used to make tamales. Both ingredients are readily available in Texas grocery stores, or Mexican groceries everywhere. While chocolate and coriander are used in interior Mexico (chocolate in mole sauce), you won’t find them in Texas chili. Hi Dave, I knew I get in trouble calling this Texas chili 🙂 I opted for cornmeal because masa is not easy to find in many parts of the country — and cornmeal does the same thing. And the chocolate adds nice depth, even if it’s not traditional. I would like to try this dish.however my family and I do not eat pork. What can I substitute for the bacon? Hi Euclid, Go ahead and just leave it out; you’ll just need to add vegetable oil for searing the beef and vegetables. It will still be delicious. Can I add beans to this chili? Hi Ann, Yes, there is plenty of sauce if you want to throw in some beans. When should one add the beans? Hi Kerry, I’d add cooked/canned beans after about 2 hours. What kind of beans would you suggest? Have you tried any other vegetables?